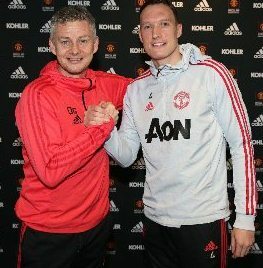 Through a publication on their official website, Manchester United have confirmed that central defender Phil Jones has put pen to paper on a new long-term deal with the club, signing on until at least June 2023. Jones, 26, would have become a free agent this summer but has taken the option to sign a prolonged contract with the Red Devils, with an option of a further twelve months upon its expiration. The England international has been with United since joining from Blackburn Rovers in 2011, winning every of the division's domestic title as well as helping them to an Europa League Cup triumph in the 2016/2017 campaign. "I am delighted to have signed a new contract. Manchester United has been a big part of my life for eight years and I love everything about this club," he told the club's website. Since his debut in October 2011, Jones has made 27 senior appearances for the England national team.